Whether you’re sending 10 or 10,000 messages, there’s no sense in retyping or fumbling with your copy and paste. With templates, and the ability to duplicate campaigns, you can reuse frequently sent messages, autoresponders and keyword autoconfirmation messages. Creating templates is easy. See for yourself in this short video! For now, you can only use the duplicate feature on campaigns. Your templates include the “opt out” language automatically, meaning you have 160 characters minus the characters from your compliance message. Chat with one of our support specialists if you need to work around this. There are a few ways to help you if you need more character space! Templates are unique to the location you create them in. For example, if you create a template autoresponder, it will only show up as an autoresponder template, not in your saved templates for keywords or messages. 1. You can use templates for campaigns, autoresponders, keyword confirmation messages, and individual replies in your inbox. For this example, we’ll create a campaign template. 2. Click Campaigns on the left-hand panel of your dashboard, then click New Campaign. 3. Click Use template from the options in the message box. 4. Click Add Template and give it a name for your reference. 5. Type out the message you wish to serve as your template. To save, click Add Template. 6. Done! Now, any time you want to use this message, all you have to do is click Use template again and select it. The text will automatically fill in to the message box, and you can send the campaign as you normally would. If you’re looking for some inspiration on how to use templates, check out some ideas. 1. Click on the Campaigns tab to view all of your existing campaigns. 2. Select the campaign you want to duplicate. 3. Click the “copy” symbol at the top right, next to the delete button. 4. That's it! Give your campaign a new name and send it. 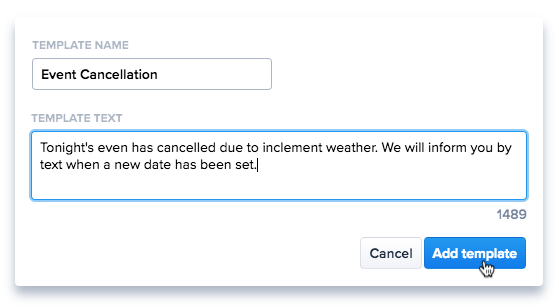 SimpleTexting Tip — Custom Fields in Templates ☝️ You can also insert custom fields into your templates. While the “custom fields” button will not appear, you can copy and paste the merge tag into the template to achieve the same outcome. The only place custom fields cannot be used is the inbox.